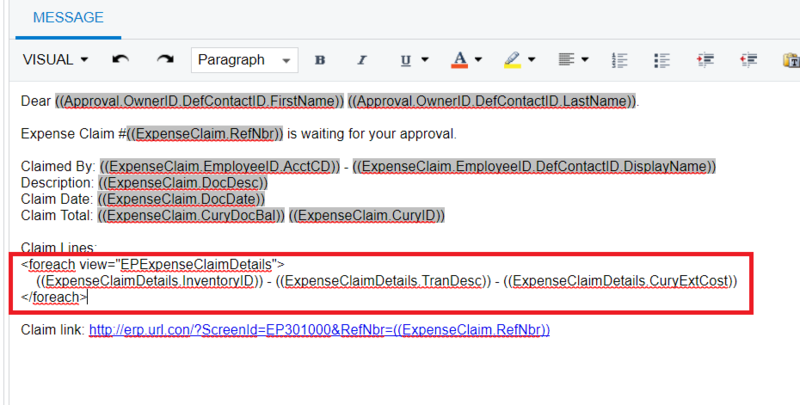 There is a nice functionality in Acumatica that allows you to print details of the document inside the notification template. view=”Products” – this is a view name that is used to get data from database. You can find a view name from “Inspect Ellement” customization tool or from other Data Fields. 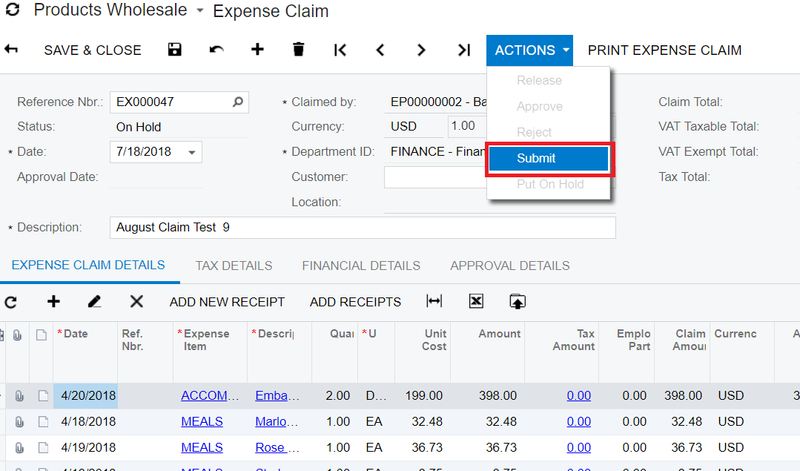 Data field has format like “((Products.Quantity))” – here “Products” is a view and “Quantity” is a field. </foreach&gt – is the reserved word fro the end of the loop. Everything what is between beginning and the end will be repeated by number of the details in the document. 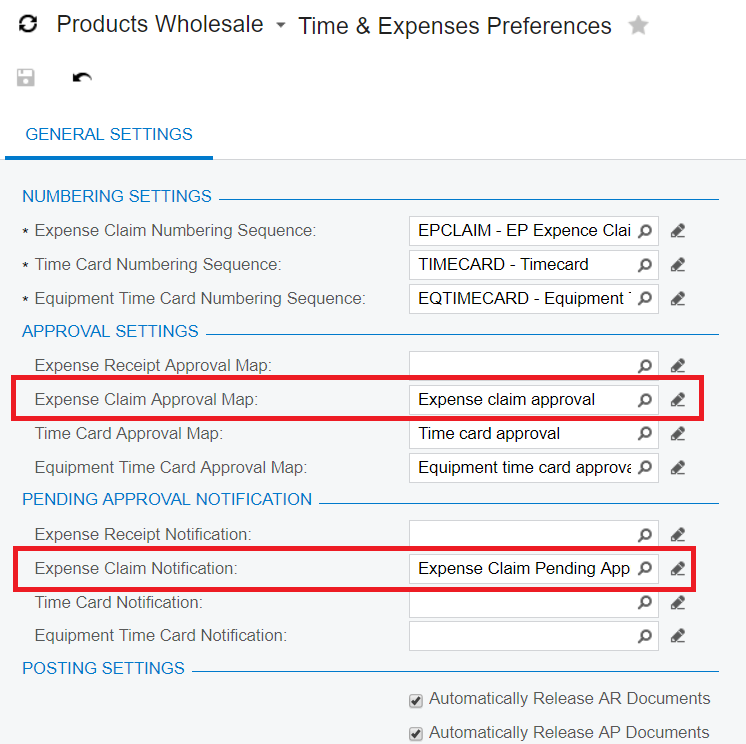 You can read little bit more about it this functionality in the Acumatica help. Note that you can use all possible HTML within a foreach loop. Here I would like to share with you my own experiments. I wanted to print claim details inside standard notification template. To make it nicer I also added borders around lines and high-lighted the line amount. First Step is to Setup Notification Template. For the beginning you can use simple construction like this for details. Later you can do more experiments and make HTML nicer. Second Step is to setup Notification and Approval workflow in the appropriate module settings. Third point is to create a claim and submit it. Please note that claim should meet your approval notifications. 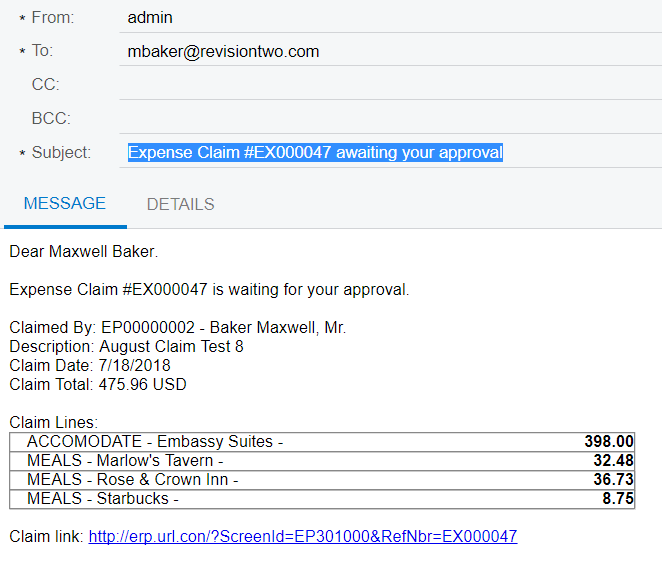 As soon as you submit a claim, notification should be generated and you can see it on the “Emails Pending Processing” or “All Emails”. As soon as this is solved you can continue with some more nice experiments. Here I have tried to add borders and put every single line in the box with CSS styles. Border shadow is needed to collapse inner borders between divs. This is nice functionality indeed. I am experiencing a issue where the loop is not hidden in the message body. Please note above that I have encased the view name in braces in case 1] and in quotes in case 2]. I am looking forward in hearing from you. Could you please show me whole foreach loop code. What view are you using in the loop definition? Also could you please try to use Email Templates with new Business Events notifications? And lastly – I guess it will be good to try to use only one level of fields from first and than make it more complicated. Pre tags did not help – essentially; the foreach loop is not functioning as expected in the Automation Notification email body. Thank you very much for your reply and suggestion – will look into Email Templates with Business Logic. I have broken my examples with “” to force it to show for you. Can you try this way? And certainly I suggest to move from Automation Notifications to Business Events.